When you’re launching a membership site the last thing you want to do is worry someone will steal the content you’ve worked months or even years on. Instead you’re day dreaming how people are going to pay for a month and get all the content of your site. Then ask for a refund. You know it doesn’t make sense worrying about this, but fear is such a primal element fighting and suppressing it makes you tired and stressed. As if making a new membership site wasn’t stressful enough. You’re day dreaming how people are going to pay for a month and get all the content of your site. Then ask for a refund. However, the last thing you want to do is make it hard for users to access your content. DRM technologies, limiting access in certain countries, legal threats have been proven to fail again and again. Wouldn’t it be nice to know users will still be around weeks from now and really give your content a chance. The only sustainable way to keep users after the first month is for them to be involved with your content, giving users a sense of ownership and a feeling of money well spent. That will make it less likely for them to discontinue their subscriptions. When allowing users to have access to content in steps, you should definitely do it for the right reasons. While it might be a deterrent with users who access your content and then unsubscribe, content dripping’s power has to do with how people learn and their sense of ownership. When you’re leaning about something new the last thing you want is to have access to everything right up front. It makes it easy for our brain to comprehend the information without feeling overwhelmed. You feel discouraged on how much information is available on the subject. Thoughts about how “you’re never gonna be able to learn all that” crop up whether you want it or not. That’s why learning things from the beginning in a step by step manner is such a powerful method when digging into something new. By limiting the initial content you’re basically giving the user the proper time to go through all the available material before moving forward. Keeping users engaged is probably one of the hardest things to pull off in a membership site. Creating content is hard, making it interesting is even harder. While content dripping won’t make your content less boring, if setup it up correctly, your users will have just enough time to go through the available information and at the same time leave them wondering about what’s coming next. While learning in a step by step fashion makes large pieces of content manageable, getting a feeling of progress when learning something new is one of the best feelings you can push for. Having content dripping enabled, changes your mindset and forces you to better structure your entire content. If I got you curious, let’s get started! Go to demo.cozmoslabs.com/paidmembersubscriptions/ and create a new demo site. If you’re interested on how we created the demo site, check out this full article on how to create a demo site with WordPress multisite. This will give you access to a full WordPress instance with Paid Member Subscriptions active as well as all the Addons for it installed but not active. Once inside the newly create demo site, we need to activate the Content Dripping Addon. Doing so gives us access to a new menu under Paid Member Subscriptions -> Content Drip Sets. I took the time and created 10 new empty posts, each posted in 3 different categories. 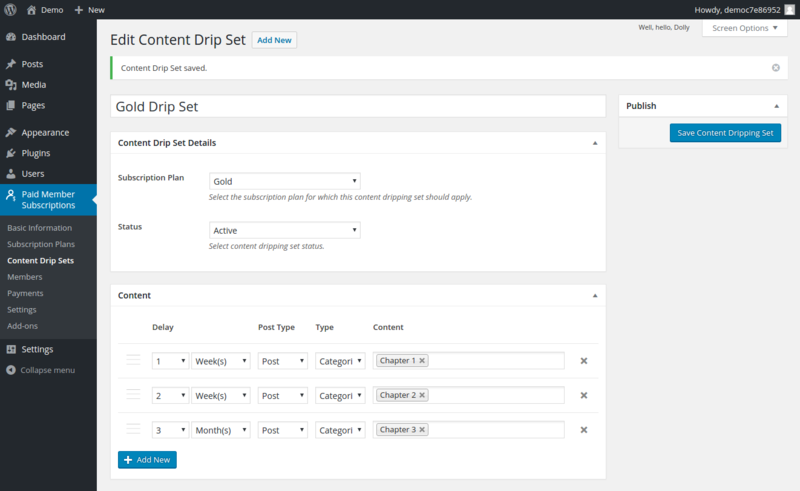 This way we can easily differentiate between each chapter that will be opened via our content dripping setup. It’s important for members to see what content is available and what content will be available in the future. This way they know when to expect new content and how much time they need to wait until the entire course is available. Content Dripping is one of the most easy to use tools when dealing with users unsubscribing from a membership site. It makes them take the proper time with the available content without getting discouraged early on by large quantities of content. Also, splitting content into chapters forces the author into a more structured mindset which can change the way the information is presented to members. Learn more about Content Dripping today.